Exclusively ours! 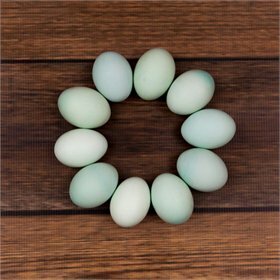 For Super Blue Eggers, we've taken our favorite egg-laying breed and crossed them with our most vibrant blue egg layers.The result: prolific layers of large, blue-tinted eggs. While our "recipe" may be secret, don't keep your birds a secret—show them ladies off! 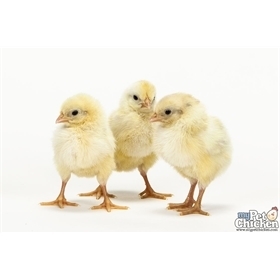 They start out as adorable yellow chicks who will grow up to be lovely white-with-black-flecks throughout. The Super Blue Egg Layers are friendly and curious, but best of all, they are extremely versatile. You'll find they will do well in both warm and cool climates and produce large blue eggs at an astounding rate, hence the "Super" in the name! Our girls average five to six eggs a week, even through the heat of summer. 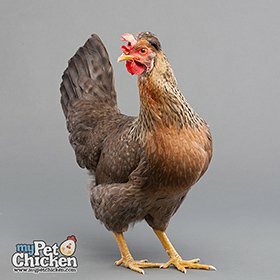 Super Blues will have pea combs and lay blue-tinted eggs. Your ladies will typically begin laying at 22-24 weeks of age, so get ready for a basket full of big, blue-tinted, gorgeous eggs. This particular mix, new for 2017, does tend to go broody, as reviews will attest, so bear that in mind! If you don't have the patience to break a broody, we'd recommend Legbars instead. 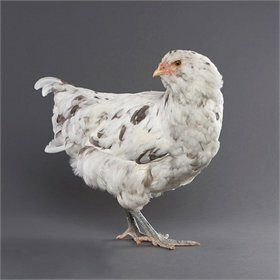 The Super Blue variety is a custom cross, bred exclusively for My Pet Chicken. On average, 15/16 pullets will lay blue eggs when they mature. Because these are first generation crosses (F1), statistically, 1 out of 16 birds will have a single comb and will not lay blue eggs. Please also keep in mind that your blue eggs may be anywhere from pale blue hued to a more intense, aqua blue. There is no chicken to our knowledge that lays sky-blue eggs!